Hey everyone! Dark System recently entered open alpha and the feedback has been really great so far. Dark System is a physics-based top down space shooter in an open galaxy. It has really fun combat, and meaningful progression and customization. Check out the game page for more info! If you like games like Space Pirates and Zombies, Xenoraptor, Ring Runner: Flight of the Sages, or Endless Sky, I think you will really like Dark System. It is still very early in development so there are still a lot more features to come! We are looking for as much feedback as we can get, so please check out the game and let us know what you think! Thanks! Just added Repulsor Beam weapons! You can use them to push enemy ships into stars, planets, asteroids, or other ships. Star Map added! This should make it much easier to find where your missions are. It still needs a bit of work and a tutorial. 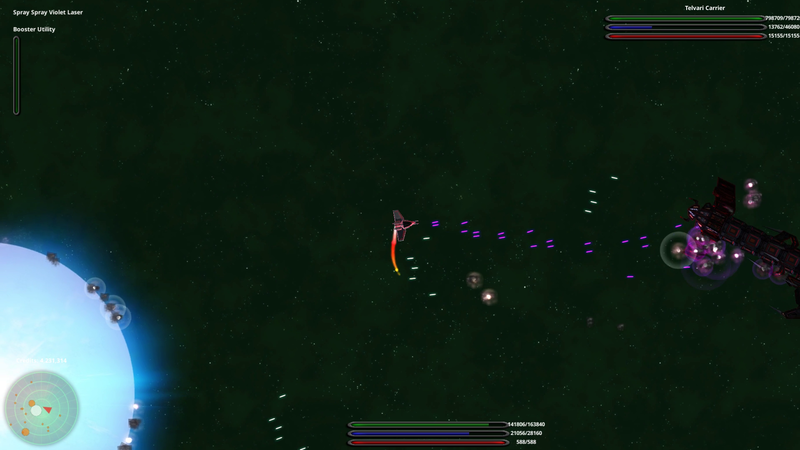 Changed enemy AI targeting to be less ridiculously accurate (mostly with beam weapons). Still have some work to do in this area. New Plasma Thrower weapons! Basically a really sweet flamethrower that deals tons of damage at short range. Reduced stat increases between tiers for all equipment except engines. I'm really digging your plasma blast here! Increased size of stars, planets, and asteroids. 5 new ships! The rare Interon ships are powerful fighters with multiple weapon mounts. Ships rebalanced. Number of weapon mounts more important when calculating PL/price. Ship AI now has a reaction time, making it have more realistic accuracy. Should make enemy ships less OP when using beam weapons, and reduce the overall difficulty of the game. New weapon - Vulcan: Heavy rapid fire machine gun with explosive bullets. Deals extra damage against ship hulls. Windows, Mac, and Linux updated. Note: Saves from older versions are incompatible with this version. New Feature: Trading System! It is just a prototype at this point and still needs a lot of work. Equipment in shops is now persistent. The equipment they have for sale will no longer change whenever the galaxy screen is loaded. Will add a way for shops to acquire new inventory in the future. New Positron Core: Has very high capacity, power, and stability, but reduces your ship’s move speed and thrust. Unique to the Omegais faction. Fixed issue with Close buttons and some equipment buttons in the Hangar not responding. Beginning of game now much easier. First enemy ships you encounter have much slower reaction time, and reduced accuracy. Trading system greatly improved. Buy and sell prices are now different for trading goods. Difference between them is dependent on your relationship with the faction or star system you are trading with. You will typically get much better prices at star systems you own. Ability to color star map based on price of different resources. Rebalanced how weapon modifiers (like Spray, Oct, Sniper, Overcharged) affect power level and price. Tri, Pent, and Oct weapons should now be priced accurately (cheaper than before). Waves should no longer spawn very close to the player, or on top of a planet. Button in Star Map to automatically travel to selected star system. I need to try this out, and give some feedback. Gameplay was good, not all too special though. The menus were a bit "dry" maybe add pictures of the spaceships/engines/weapons. The weapon name "Yellow Blaster" is easy to understand, but could be pepped up a bit with a cooler name. I like the menu music, but I find the in-game rock music unfitting. Hope this helps! Maybe if you have the time you could critique my project "Catacomb Chess". Just finished trying it out. I really like the concept! I did find it a bit weird that the enemies don't seem to move exactly on the tiles like the player does though. Sometimes it wasn't clear whether or not moving to a tile was actually going to kill an enemy that was partially on the tile. I also feel like being able to move all of your pieces in 1 turn, and the fact that the enemy can move in any direction, takes away some of the strategy. Chess is a great game, and I think making some smaller variations of it could be really interesting. Chess with some new pieces, and some boards that are smaller, larger, or a different shape, set in a fantasy setting would be a ton of fun! Mission details and button to abandon mission added to Star Map. Feedback Shield: High capacity shield that returns 20% of the damage taken back to the attacker. Hardened Shield: High regeneration shield that reduces all incoming damage by a set amount. Matrix Shield: Balanced shield that slows down nearby projectiles by 40% per second. Engines rebalanced. Fast engines are now cheaper. Temporal Engine: Powerful engine that has the ability to slow time by 50%, as well as increase the ship's speed and thrust. Dash Engine: Extremely fast engine with very little thrust that has the ability to instantly accelerate your ship greatly. SFX Changes. New explosions for Plasma weapons. 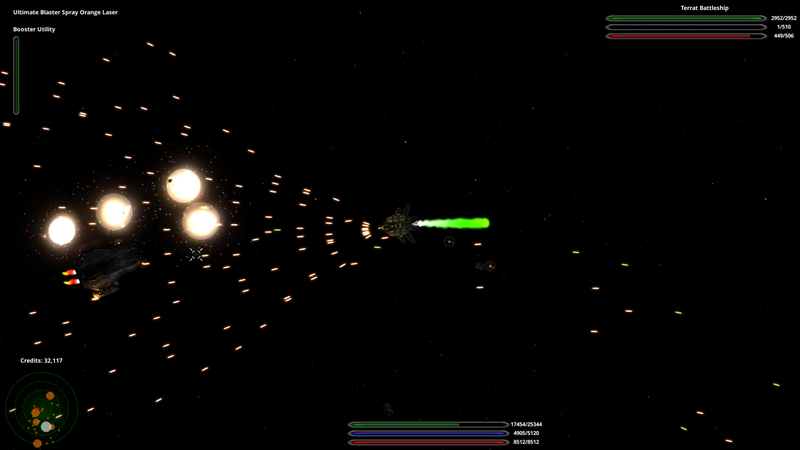 Tweaked lighting for blaster and plasma projectiles. Power level of independent systems is now dependent on the power level of nearby factions, instead of distance from starting area. Star system defense missions now increase the income of the system you defend. Declining a mission from a star system will now give the star system a new mission. Fixed UI for extremely high resolutions. When you die, you now lose credits based off of the value of your ship and the difficulty level. Cores and shields rebalanced. Core power and shield regeneration are now considered more important when calculating power level and price. All cores and shields shifted to have more power and shield regeneration relative to capacity so that high capacity cores and shields are more useful and don’t require you to wait for long periods for them to recharge. Trading price information now restricted in areas of the galaxy you have not visited. Instead of a few nebulas that are always in the same place, there are now more than a hundred randomly placed throughout the galaxy. Some of them look really cool! Ships now have a sensor range, which determines how far you can zoom out in combat, and at what distance enemy ships will lock on and start firing. It is currently just proportional to the size of the ship. Move speed on galaxy is now separate from ship engine speed. It is now based on warp engine speed, which is upgradable in the hangar. Trading system improvements: Introduced ability to upgrade production and consumption rates of owned star systems, allowing you to manipulate the market. Added average price for buying and selling in bulk. Price recovery slowed down. High price systems are now just as common as low price systems. Map of trading prices now updated in real time. Icon colors changed to the more standard color scheme of red being lowest, instead of yellow. “More Information” button on star systems that allows you to see the star system’s resource production and consumption. Story revamped to get to the interesting stuff faster. Trading tutorial added. Try it out! New ship: Manta. High end medium sized ship. Very slick design. Hornet Missiles: Small, fast missiles. Exclusive to Zarykor. X Missiles: Medium sized missiles, that knock back targets a small amount. Antimatter Missiles: Large, powerful missiles that knock back targets a lot. Rare. New explosion effects that match ships better. Difficulty level now affects trading prices. Fixed bug with being able to spend money you don’t have to upgrade warp engine. Trading tax displayed in “More Information”. Fixed bug with “Visit the Telvari” mission not working. When using missile weapons on a ship with multiple weapon mounts, fire only one missile. Options in start menu implemented. Revamped movement in galaxy to be physics-based and smooth. Display cargo capacity of ships in shop and hangar. You can now own multiples of ships and equipment.